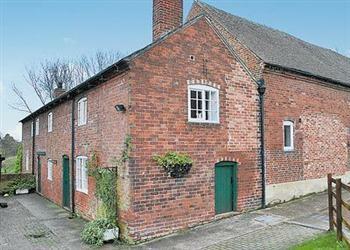 Burdett’s Cottage, Foremark Cottages in Milton, near Repton sleeps 4 people. Formerly part of the Foremark Hall Estate and on the edge of the National Forest, these three Grade II listed properties (refs 25349, 25347 [Foremark Threshing Barn], 25348 [Repton Cottage]) date from 1752. They enjoy a peaceful rural holiday location with excellent local walks and great views of the Grade I listed Foremark Hall, a Georgian-Palladian country house. Foremark Threshing Barn is a beautifully converted spacious barn with a full height atrium style dining area displaying the original roof timbers and galleried landing. From here, full width French windows lead to a large garden which features a paved patio area with garden furniture and a barbecue. Repton Cottage is named after the nearby village of Repton, the historic capital of Mercia. Burdett’s Cottage is named after the Burdett family whose ancestral home was Foremark Hall next door. Featuring cosy living rooms with wood burning stoves and exposed timbers, the traditional brick cottages of Repton and Burdett’s make perfect rural holiday retreats. Shop and pub 1 mile. All Properties: Elec and bed linen included. DVD. CD. Electric cooker. Microwave. Shared lawned garden and courtyard. Sitting-out area and furniture. Barbeque. Shared games room with table tennis, pool table and table football. No smoking. Ground floor: Living/dining room. Kitchen. First floor: 1 double bedroom with en-suite shower room and toilet. Beams throughout. Woodburner in living room (initial fuel included). Convector heaters included. Parking (2 cars). Holidays at Burdett’s Cottage, Foremark Cottages run from Saturday to Saturday. For a better idea of where Foremark Cottages - Burdett’s Cottage is, you can see Foremark Cottages - Burdett’s Cottage on the map below. Foremark Cottages - Burdett’s Cottage is in Derbyshire; should you be on the lookout for a special offer, you can find all the special offers in Derbyshire. It's always worth checking to see what is on offer at the moment. Do you want to holiday near Foremark Cottages - Burdett’s Cottage (25349), you can see other cottages within 25 miles of Foremark Cottages - Burdett’s Cottage; have a look to find your perfect holiday location.